Given the right—or, as it were, exactly wrong—nutritional circumstances, even a person’s oldest injuries never really go away. In a sense, there is no such thing as healing. From paper cuts to surgical scars, our bodies are mere catalogs of wounds: imperfectly locked doors quietly waiting, sooner or later, to spring back open. The Carlin Trend was discovered in north-central Nevada, near the town of Elko, in 1962. Exactly fifty years later, at the time of this writing, it remains one of the world’s largest actively mined deposits of gold ore. In fact, the region has become something of a category-maker in the gold industry today, which describes analogous landscapes and ore bodies as “Carlin-type” deposits. The Carlin Trend is a standard, in other words: a referent against which others continue to be measured. The trend’s discovery and subsequent exploitation—and the extraordinary negative landforms that have resulted from its exhumation—has been a story of nineteenth-century US mining laws, legally dubious public land provisions, extraction industry multinationals, advanced geological modeling software, specialty equipment few people can name let alone operate, genetically-modified bacteria mixed into vats of gold-harvesting slurry, and, as we’ll see, toward the mine’s latter days, the virtuoso representational skills of an aerial photographer. But we’ll return to that. “Some people believe”: More is hidden in the apparent neutrality of Seabrook’s phrase than we might, at first, suspect. Mining for gold—the actual, violent excision of waste rock from the earth, searching for ore—is never a question of finding a perfect, shining lump of solid metal and carefully, surgically removing it from the planet. Gold is diffuse. It is now more often mined as particles, not blocks or even nuggets. Like glitter, it is scattered throughout the rocks around it. In fact, gold, in many cases, can only be inferred. The way local rock strata dip back into the planet, the direction water flows through the landscape, or the other minerals and crystals locked in the rocks underground: These all, to varying degrees, act as tell-tale signatures for the famously coy king of metals. Gold is less discovered, we might say, than interpreted, with mining thus an oddly literal act of deconstruction. The Carlin Trend has thus served as a test site, now in its fiftieth year, for various interpretive techniques, both scientific and superstitious. Specialty journals3 refer to the region’s “geochemical patterns”—subtle glimpses of which they analyze for “the characteristics, signatures, and genesis of Nevada’s world-class gold systems”—the idea being that these might be found again elsewhere and thus be more instantly recognizable. Geologists track concentrations, contours, “metal zones,” and mineralized fractures; they build models of “stacked geochemical anomalies” in the earth below, hoping to piece together an accurate model of the gold ore’s location. Where the gold came from in the first place is yet another interpretive preoccupation. A paper—forthrightly titled “Is the ancestral Yellowstone hotspot responsible for the Tertiary ‘Carlin’ mineralization in the Great Basin of Nevada?”—suggests that the gold of the Carlin trend is actually a thermal after-effect, or geochemical ghost, of the still-nomadic Yellowstone hotspot which once pulsed and geysered beneath Nevada. In any case, the form of a gold deposit itself must be mapped and clarified before excavation can begin. The shape of the ensuing pit is not the result of frantic, directionless digging, but of a carefully controlled design process. The word design is used deliberately here, even if the shape of the pit is orchestrated not by aesthetics but by the needs of financial rationality. Using proprietary graphics software—similar in function to visual effects programs used in film, gaming, and architecture—the ore body is predictively 3D-modeled. Mining, at this point, becomes less an act of extraction than of physical verification: machines and their profit-minded operators pursue the outlines of a virtual form by gradually expanding the mine’s target zones, in effect checking to see if the geologists’ models were right. But then what happens is, based on gold prices, the pit model changes. In other words, if the gold price or the mineral price is higher, then the pit gets wider as it becomes cost effective to mine areas of lower concentration. This happens nearly in real-time—the speed of the machines digging the pit can change over the course of the day based on the price of gold, so the geometry of the pit is utterly parametric, modeling these distant financial calculations. The very idea that gold has value is a funny thing. Aside from a few basic industrial uses, gold’s value is almost entirely ornamental—that is, it is agreed upon by traders and markets, even if no actual gold changes hands. Gold comes out of one, carefully designed hole in the ground—whether in Nevada, in South Africa, in Western Australia—only, most likely, to be interred again in another part of the world in a bank vault or federal reserve, where it is precisely gold’s removal from direct exchange that augments its value and its mystery. This “formless form,” however, undergoes a strange—we might say alchemical—transformation, from shining metal to the rarefied super-object known as money. In a long description by Taussig, based on a nineteenth-century memoir by Captain Amasa Delano, readers are introduced to the process of minting coins from gold bullion. For Taussig, this process reveals the machinations “both mysterious and everyday” by which a mineral becomes money—that is, how “gold and silver coins become enchanted, material things, aglow with a power emanating from deep within.” This base matter has been transformed, given exchange value through formal regularity and sent off to participate in a global system of monetary transactions. Gold coins are thus but one of the “minutiae in which the supernatural is secularized,” in Taussig’s words: a haunted mineral is pulled from the earth and given an uncanny second life elsewhere. The spectral mathematics that turn reserves of gold into abstract instruments of monetary exchange—into financial products and debt instruments, derivatives and funds—operates through a barely comprehensible carnival of surrogates flashing back and forth through the global marketplace. Until the end of the Bretton Woods system in August 1971, when the US dollar was unilaterally decoupled from the international gold standard, gold served as a reliable, universally recognized equivalent for economic exchange. Gold, in the words of Jean-Joseph Goux, citing Marx, had value precisely because it could so effectively disappear into the “circulation of substitutes.” This is a logic of exchange by which Object A can be traded for Object B, as long as we agree that Object B also refers, off-stage, to something else entirely: some standard or reserve for which it acts as a practical surrogate. Before 1971, that off-stage presence—that silent original, sleeping in a state of eternal reservation—was gold. 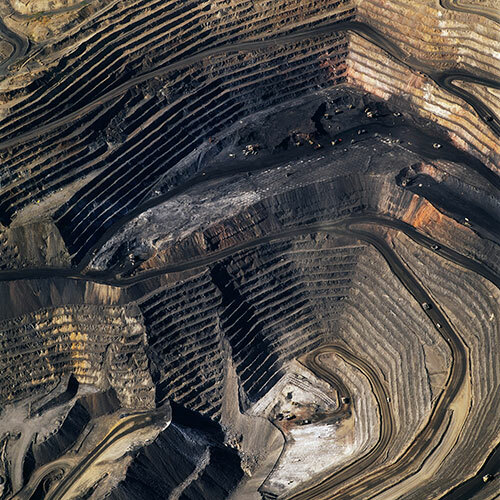 In 2007, David Maisel began work on a group of photographs called American Mine, part of a larger and older series known as The Mining Project. These images document, in extraordinary abstract swaths of color, the emergent geometries of mines along the Carlin Trend. Vast terraced bowls step down—and down and, impossibly, farther down—tracking dead faults and mineralization fronts on a scale only made clear when we notice sixteen-ton trucks like specks of dust on canyon walls. Discolored oceans of chemical runoff wash across vehicle tracks with acid tides. Retaining walls and stabilized slopes loom over assembled superscapes of mine detritus, abandoned shells of industrial insects dwarfed by the world they’ve helped create. In these scenes, geotextile mats have all but replaced the earth’s surface, offering instead a deathless, replicant topography; artificial hills, each uncannily and exactly like its neighbor, roll from one side of the frame to the other, shifting in tandem with commodities prices, their malleable geography thus forever resistant to mapping; and evidence of future dynamiting can be surmised amid the rubble, as yet more excavation is to come. These mines grow in great metastasizing voids, like storm fronts of negative space exploding with slow thunder into the planet. Other essays in this book describe the toxicity, environmental degradation, and chemical ruin that appear with such astonishing, polluted beauty in Maisel’s photographs. What specifically interests us in the American Mine series is its revelation of the injuries at the start of the commodity chain: planetary wounds, seemingly beyond the breadth of nature, out of which so many of the things we encounter and exchange everyday have been extracted. The production of economically recognizable objects can thus be seen, based on the insights offered in Maisel’s work, as a kind of terrestrial focusing: out of the chaos of the mine site, with great lakes clouded by geochemical effluent and abstract landforms like ritual mounds from human prehistory, pristine products eventually emerge, assembled from these heavy elements torn so roughly from the ground. Out of the carcinogenic discord of rock dust, circuit boards appear. In a sense, it is surprising that the computers, phones, batteries, television sets, and other mundane electronics that fill the markets of the world are so free of this fallout, so astringently cleansed of the geological evidence of their own creation. Or perhaps we might say that it is precisely this stripping-away of a product’s elemental birth that gives it its later value and utility. Such products are ironically de-terrestrialized: washed of the very planet from which they came. Maisel, lashed firmly into an airplane and roaring overhead through aerosolized clouds of mercury, arsenic, and other metals—toxic weather found above any such site of extraction—shows us, urgently and terribly, the surgical tools and sacrificed landscapes through which a whole world can be disassembled. The surface of the earth is unpeeled to reveal diffuse mineral deposits lying in wait below; a geologist’s 3D model is experimentally verified; the next site is prepared for entry. This is a catalog of terrestrial investigation at its most violent. Scattered across these and other images in the book is a forensic survey of such cuts and incisions—wounds that will outlive us, scars that won’t go away—older surgeries through which modernity has, in effect, been created. The mines of the Carlin Trend remain unhealed—in fact, year on year, they are growing—a raw scurvy of rocks exposed on a scale so monumental that geologists estimate mines, not cities, will be the final trace of humanity left visible in a hundred million years’ time, a common weal of injuries through which civilization once thought it could run forever. 1 Jason C. Anthony. “The importance of eating local: slaughter and scurvy in Antarctic cuisine,” Endeavour, Vol. 35, No. 4 (2011). 2 Quotations by John Seabrook from, “A Reporter at Large: Invisible Gold,” The New Yorker, April 24, 1989. 3 All quotations in this and the next paragraph from Ted G. Theodore, et al., “Applied Geochemistry, Geology, and Mineralogy of the Northernmost Carlin Trend, Nevada,” Economic Geology, Vol. 98, 2003. 4 See Gary L. Oppliger, et al., “Is the ancestral Yellowstone hotspot responsible for the Tertiary ‘Carlin’ mineralization in the Great Basin of Nevada?” Geology 25, no. 7 (July 1997). 5 See Geoff Manaugh, ed., Landscape Futures: Instruments, Devices and Architectural Inventions (Barcelona and Reno: Actar/Nevada Museum of Art, 2012). This becomes predictive on a much larger scale as well. By constantly refining their models of how exactly gold forms in the first place, and where and how it can be mined most effectively, geologists can understand where—and, to some extent, predict when—future ore bodies might accumulate. Interestingly, these future deposits will appear on a timescale that far exceeds human civilization—so, while human miners most likely won’t be around to exploit them, it’s nonetheless intriguing to know that serpent-like veins of precious metal are incubating in the darkness beneath us. 7 Michael Taussig, My Cocaine Museum (Chicago: University of Chicago Press, 2004). 8 See Jean-Joseph Goux, Symbolic Economies: After Marx and Freud, trans. Jennifer Curtiss Gage (Ithaca: Cornell University Press, 1990). 9 In this context, ongoing attempts to return the United States to the gold standard—by, for instance, perennial Republican presidential candidate Ron Paul—can be seen as an almost folkloristic attempt to put the genie of infinite derivative exchange back in the bottle.